← Is Your Senior Having a Negative Reaction to Immunizations? 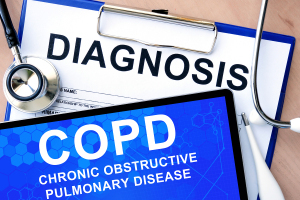 Your loved one’s COPD is something that you’ll need to manage together. Here are some tips for doing that without driving each other crazy. Your loved one’s doctor can help you both establish a care plan for her COPD management. This can involve medications, diet, exercise, and other aspects of her care. Once you have a framework, you can start to build out from there to personalize your loved one’s care plan. COPD is a progressive disease. That means that over time, her condition is going to grow worse. If you can prepare for that now, it will be much easier for you to deal with when that time arrives. One way to do this is to continue to learn as much as you can about COPD. Joining support groups for both caregivers and sufferers of COPD can help, as well. Your loved one is highly likely to have good days and bad days with COPD. What that can mean is that on some days, she can do quite a bit on her own, but other days are extremely difficult for her to manage. Having home care services providers available on call can help your loved one feel more secure on the bad days. Assistive devices, such as grabbers or walkers, can help your loved one quite a bit. These devices keep your loved one from over exerting herself so that she can preserve some of the energy that she has. Try a variety of assistive devices to find the right ones for your loved one. If you’re not already prioritizing your own self-care, it’s time to do so. This helps to ensure that you’re ready and able to help when your loved one needs you the most. If you don’t do this, you’ll both be run down and that doesn’t do anyone any good. Once you have a plan, periodically revisit it so that you and your loved one can make changes as necessary to keep meeting her needs. This entry was posted in Challenging Diseases/illnesses/Conditions, Home Care Services Bartlett TN and tagged Home Care Services Bartlett TN. Bookmark the permalink.